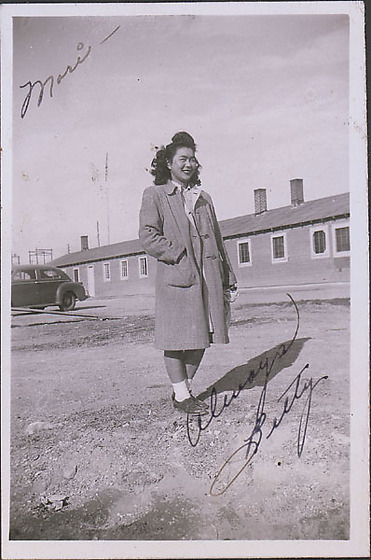 Portrait of a young woman, Betty, standing in an overcoat in front of a barracks and car at Heart Mountain concentration camp, Wyoming, Winter 1944-1945. She stands turned slightly to the right with proper right hand in pocket. Her hair is curly and legs are exposed. She smiles to the right of viewer. She stands on open dirt area with shadow extending back to the right. Barracks and car in background. Written in black ink on image: Mori-- / Always / Betty.